Nearshore ichthyoplankton assemblages are constantly influenced by the dynamics of coastal environments (i.e. daily thermal gradients and coastal currents), as well as by regional environmental forcing, such as upwelling events. 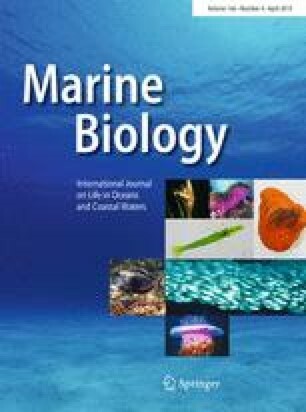 The aims of this study were to describe larval and postlarval fish assemblages on a short-time scale and relate their intra- and interannual fluctuations to local (< 1 km) and regional (~ 40 km) oceanographic conditions, at two locations of central Chile (Montemar and El Quisco), 50 km distant from each other. Environmentally, spring–summer 2015–2016 was more stable than spring–summer 2016–2017, evidencing weaker temperature fluctuations. In addition, the first season of the study showed positive temperature anomalies that agree with the warm phase of El Niño–Southern Oscillation (ENSO) 2015. Both larval abundance (29,090 ind. 100 m−3 period 1; 23,100 ind 100 m−3 period 2) and postlarval CPUE (6.8 ind. light trap−1 night−1 period 1; 4.8 ind. light trap−1 night−1 period 2) decreased in the second period of study. The structure of the larval assemblages was significantly related to seawater temperature and wind regime, and showed seasonal fluctuations in the abundance, with higher densities in spring, and lower in summer, while postlarval assemblages did not relate significantly to any physical variable. At the interannual scale, the stability of the water column probably promotes fish reproduction, allowing higher larval abundances, while an environmentally unstable year could alter reproductive processes. Local topography influences environmental conditions: El Quisco is more exposed to regional upwelling, and showed higher abundances, species richness, and a predominance of benthic species. Abrupt weekly fluctuations in ichthyoplankton composition and abundance point out that fish larvae can quickly respond to short-term environmental variations. Reviewed by R. Funes-Rodriguez and W. Watson. We want to thank the field work of Sebastián Báez, Mirna Castillo, Hernán Castillo, Andrea Colilef, Jorge E. Contreras, Juanita De Los Ríos, Alejandra Díaz, Pamela Díaz-Astudillo, Bastián Fernández, Gabriela Kanamori, Américo López, Ricardo Maturana, María-Antonia Reculé, Cristian Osses, Victor Molina, Marcos Morales, Valentina Nowajewski, Nicolás Pérez, Javier Polanco, Camilo Rodríguez-Valentino, Javier Vera-Duarte, and Francisca Zavala-Muñoz. We also thank the helpful comments of two anonymous referees who contributed to improve this manuscript. This work was funded by Comisión Nacional de Ciencia y Tecnología, CONICYT, Fondo de Fomento al Desarrollo Científico y Tecnológico [Grant number 1150296]. All procedures involving animals were performed in accordance with the Ethical Standards of the Universidad de Valparaíso and were approved by the Comité Institucional de Bioética para la Investigación con Animales (CIBICA), code 048-2015.